With Adlens Sundials™, you can see up close, into the distance and all around you, at the turn of a dial. Great for sharing, keep your convenient pair of Adlens Sundials™ in your suitcase, beach bag, golf bag, boat, or tackle box. Featuring continuously adjustable lenses, these durable and lightweight glasses are perfect for any outdoor activity. With a comfortable unisex frame and adjustable nosepiece, Adlens Sundials™ are the ultimate spare pair for everything under the sun. From -6D to +3D diopters. Continuously adjustable from far to near. 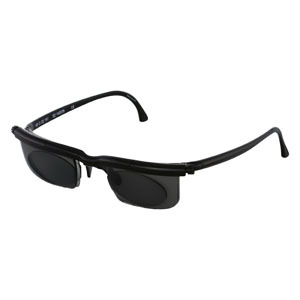 Easily change the glasses to match your needs for a variety of outdoor activities. Can be adjusted to improve vision for 90% of eyeglass and contact lens wearers who do not have astigmatism. Two wave-shaped polycarbonate plates slide across one another to change the power of the lens. Frame size 49 - 22-141.